From Davison MI, currently living in Flint. I am a closet introvert. I have been for a while now. I like my time, my space and my distance. It refreshes me. This mindset is contrary to my calling. For some reason, I am not sure why yet, but God has always been calling me to reach out to those who are on the outskirts of society. From the year I spent in New Zealand to the street ministry here in Flint, there has been a pulling on my heart for the least of these. That’s why I was not surprised when God spoke clearly and told Sarah and me to do something new. I wasn’t surprised but I wasn’t overly excited. It goes against my introverted nature. For over 3 years now I have surrounded myself with people who live on the streets. Some know my name, some call me “the cookout dude” or my personal favorite “that Jesus guy.” It has been a journey for my heart and I’ve learned to allow my heart to break for those who have little, those who need very little. The Flint Stories Project was, in the beginning, supposed to look a lot different than it does now. It was supposed to be official with funders and supporters. Sarah and I met with people who loved the idea and wanted to back it all the way. Most of who still do. But as life moves on, plans change, ideas change and The Flint Stories Project has taken on a completely different meaning and purpose. So many people talk about doing something, getting out there and being a part of the change. I got sick of the talk and decided to walk the walk. Our first time out to find a story, it was raining. We walked up and down the streets looking for someone, anyone to talk to. What we got was more than we expected. The more stories we have heard the more I am convinced that if you want to start changing things you need to start by listening. Otherwise, how can you effectively change a bad situation to good if you do not know how it affects people? Listening to these stories, recording them, writing them down, making them real, and posting them, it is all part of this grand heart change for me. Seeing people for more than the dirt on their face or the drugs in their veins. Seeing them the way Jesus does. I wasn’t sure what I was expecting when I came to Sarah with this idea. Sarah, who has refined it, perfected it and has made it much better than I could have done on my own, has partnered with me to give a voice to those who cannot speak or who will not be listened to. We are not reinventing the wheel and this isn’t anything new. We all have a desire to be heard and we all have a call to listen. Listening to someone’s story, there is healing in that. There is restoration. There is a heart connection that lasts. My hope is not that you read a story on here and think about how nice it was or how tragic it is or how things could have been different for that person had they made better choices. We are all one bad choice away from being exactly where they are but by the grace of God he has us where we are. My hope is that these stories stir up inside you a desire, a passion for those who are hurting and that you do something about it. Yes, you can share these stories along to your friends and family but, do not stop there. Be an advocate for those whose voices are not loud enough to reach other people’s ears. As we experience relationship and connection with vulnerable people, we can add our voice to theirs and work with them as agents of change. And as we make changes to policies, practices and perceptions, we can build a foundation for social change, moving forward towards a community in Flint without homelessness. And it all starts with listening. Speak up for the people who have no voice, for the rights of the down-and-outers. Speak out for justice! Stand up for the poor and destitute! This is the fifth story in a series we are calling Flint Stories Project. Please continue to check back for more stories. Feel free to contact us at flintstories@gmail.com. Every one has a story. We are listening. From Swartz Creek, MI currently living in Grand Blanc. When we started this project a few months ago, I didn’t fully realize the impact it would make for me, Patrick or the people we shared the stories with. The Flint Stories Project started out as a way for me to tell a story, but it became so much more than that. My family went through a hard time when I was in high school that made me realize no one really knows how close they are to losing everything. It was a time we never thought would happen. I bet most of the people we meet on the streets think the same thing, and yet some of us instantly stop and judge them. What if instead we chose to listen to them, show them love and give them our time? This, to me, is the point of the Flint Stories Project. I do not believe we were meant to live ordinary lives. I spent most of my life living in Swartz Creek and avoiding downtown Flint. I thought it was dangerous, and frankly there were too many one-way streets for me. The city was unfamiliar and a place I had no desire to visit for the most part. I heard rumors of it being unsafe and it was outside my comfort zone. After high school I moved out of town for four years while I attended college but moved back to the area when I found a job, which had me working in downtown Flint. My perspectives of the city have taken a complete 180 since I was in high school. I see downtown as a place of opportunity. I see it as having the potential to prosper and grow. And I see it as a place that needs more people to care. I heard people telling me that a project like this a great idea. And for awhile it was only a thought to me, too, until I decided to take the next step. The more Patrick and I walk around downtown and visit new places, the more I want to learn about the city and venture to places I never have before. I come from a suburban area, so I can’t pretend to know what Flint is all about. But I want to understand better. When Patrick first approached me with the idea of the Flint Stories Project, I couldn’t stop thinking about it and the excitement for it grew. I didn’t think of myself as someone who could just walk around stopping people on the street and asking for their life story. But where I had weaknesses, Patrick had his strengths. Together, we took action. By listening to the stories of people who have lived on the streets, the biggest thing I have learned is that you can never know the whole story unless you ask. From a man who was born addicted to cocaine, to another who had a drug problem and a woman who was so fed up with handouts, the one thing they all shared was the desire to work and provide for themselves. They became more than just a face on the street. They became more than a stereotype. My hope is that by reading these stories, you too will decide to do more than simply think about a great idea. I encourage you to create change. I never knew something so small as asking to hear someone’s personal story could make such a big difference. In the past few months I’ve learned that simply taking the time to listen to someone can not only change my perspective but hopefully theirs, as well. After sitting down and meeting them, they become part of my life, part of my story. And I hope they feel like we truly care for them as a person and as a friend. This project has taken me out of my comfort zone from time to time, but it’s helped me realize the skills and gifts God has given me and how I can use them to do something important. I am a writer and I have a heart for the people who live on the streets of Flint. 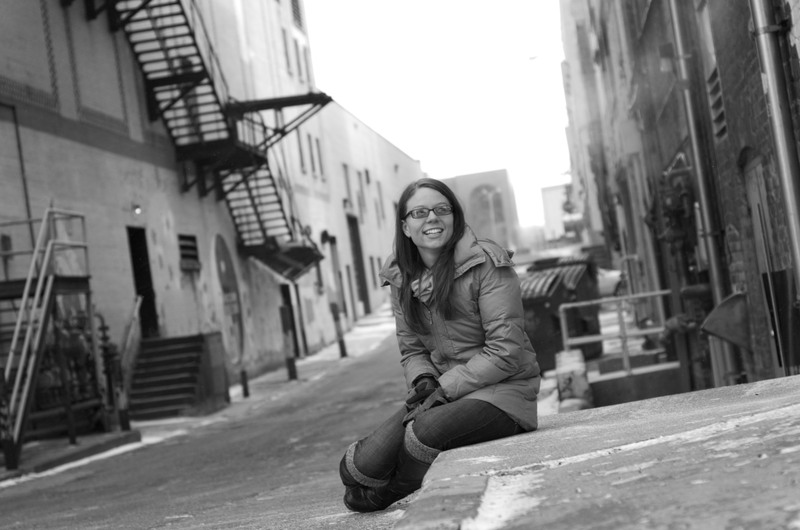 The Flint Stories Project has opened my eyes to what’s around me and who’s around me. It’s not just people in downtown Flint. There are people on the corner with signs or maybe someone who crosses your path at a store. There is always someone you could get to know deeper than face value. This is the fourth story in a series we are calling Flint Stories Project. Please continue to check back for more stories. Feel free to contact us at flintstories@gmail.com. It’s hard to find stories of people living on the streets of Flint when it’s raining in the middle of December. So instead of driving around trying to find someone who would talk to us, we decided to go right to the source of where we knew people would be — the Flint warming center, which opens up every year on Dec. 1. We pulled into the parking lot of the large, warn-down, brick building and walked to the door. To our left was a man rolling a cigarette on a windowsill in the rain. We walked down the stairs into the basement and entered a large room filled with tables, a large TV, two security guards and a handful of people watching the football game. We explained to the security guards what we were doing there and to our surprise they were eager to read the finished story. Looking around the room we approached the only woman there. When we introduced ourselves and asked if we could talk to her she immediately agreed. We sat down out of the way of others so we could hear her better. Before we could even finish telling her about our project she jumped right into her story. Her story, however, was unique for us. For the first time, we walked away from an interview with many unanswered questions. It was probably a good lesson for us to know that not everyone we walk up to will spill their entire life’s story to complete strangers. But we learned an even greater lesson than that. With Angela, she was so thankful that we simply asked to hear what she had to say. One small question made a big impact. “This is the first time I’ve really had a conversation with somebody just walking up to me,” Angela told us. Angela sits at a table at the Flint warming center. Angela feels strongly about able people working and earning a living. She started working when she was 19 years old and has a strong desire to begin taking care of herself again. Angela doesn’t like to depend on others to live her life. She wants to work, but she’s hit a few roadblocks over the years. She was born in St. Louis, but her mother moved to Flint with her and her brother because of an abusive husband. Angela’s mother started working in the cafeteria at General Motors until she began working on the line. Angela first became homeless in Detroit in the 90’s. She was hooked on drugs but shame from her problem caused her to reject any help from her family. She knew they had their own problems and didn’t want to be a burden. She was still working but had no place of her own to lay her head. She didn’t have anyone stable to depend on. But when asked how it was to be homeless, she didn’t have a negative response. She still got her hair and nails done by family who worked a salon, she had nice clothes, but technically she was homeless. “I was living champagne dreams with beer money,” Angela explained. Angela was homeless for about a year or so before the drugs became too much and she began getting care at a mental health institution. She was there for over an decade trying to get her medications under control, while also dealing with depression. That was something that has made a huge impact on her life. It was hard for her to take the medications because she didn’t like how she felt on them. “If I didn’t take the medication, they wouldn’t let me out. If I do take the medication I sign something that says the medication isn’t responsible (for health problems),” Angela said. Angela now lives in a group home in Flint, where they help her with her medication. But she wants a lot more out of her life. She wants to work or volunteer her time, anything to help her get back on her feet. In her eyes, anyone who can work should. Handouts are not something she wants to live off of. For Angela Flint is a good place to be if you’re in need or could use a helping hand. There are a lot of resources for those who need them, she said. But for Angela, she wants more than handouts. She wants to earn it. After looking back at what she’s been through, Angela now has a goal for her life. And she’s hoping Flint is the place she can accomplish that. Her mother raised her to get an education and to get a job. That is how she was taught to survive, she said. She wants to go back to school and possibly pursue a career in health care. For now her next step is to figure out how to get there. She’s working on finding a permanent home and learning bus routes to get her where she needs to be on her own. It felt good to have a job and be responsible for things in life because the stress motivated her to work harder, Angela said. She understands that life isn’t perfect, but that’s OK.
Angela asked if we needed more but was ready to get in line for lunch at the warming center. She thanked us for listening to her story and said it was a blessing that we were there. Meeting Angela showed us that there is always more to the story than what meets the eye. You just have to be willing to ask. This is the third story in a series we are calling Flint Stories Project. Please continue to check back for more stories. Feel free to contact us at flintstories@gmail.com. "I'm tired of the streets." It’s funny the way things happen, the way things are put together and how unexpected events can turn out to be unexpected blessings. As we waited for our interviewee to show at the restaurant, in walks a familiar face, Stevie. We greeted him and invited him to sit down. The first time we went to get a story we traced all over downtown Flint to find someone and here was Stevie, walking right up to us. We explained to Stevie what we were doing, how we were listening to people’s stories who have experienced life on the streets and wanted to know if he would be interested in sharing his story. Without any apprehension he said yes and jumped right in. We hardly had time to get out our recorder and note pad before he began retelling his life. Stevie outside of a building vent where he often sleeps to keep warm. Stevie is the first to admit he has made a lot of mistakes in his life and if he could do things differently he would. Now looking back he is ready to improve his life not only for himself but also for his six children, whom he hasn’t seen in years. Stevie first became homeless in 2000 after getting released from prison for the first time. He lived in abandoned houses and on the streets, trying to keep warm. Some nights when it gets too cold he sleeps under heating vents on the side of buildings and in hallways of apartment complexes. “I don’t depend on nobody. I just depend on myself,” Stevie said. Stevie began doing drugs when he was in high school, starting with marijuana. It has been a constant struggle ever since. His first wife got him into cocaine, but when he stopped when their first child was born she continued. After being homeless for 12 years, struggling with drug issues and losing touch with his children, Stevie said it was time to get motivated to make a change. This isn’t the life he wants but sometimes it’s hard to make that change. Stevie began to tell us what it was like to live on the streets and how people saw him as a homeless man. He would have finished school, waited to have kids until he had his life together and would have stayed away from drugs. Age 16 is when it all started. He moved to a different high school in Flint and started smoking marijuana after he didn’t make the basketball team at the new school. Soon he got kicked out of the school and started at School of Choice. He was ready to get away from his family so at 16 he moved out of the house and in with his girlfriend, who he married two years later. After that fell apart due to drugs and violence, he found himself divorced with two kids. By 2000 his other relationships had also fallen apart and he found himself in jail for domestic violence, which was learned behavior from his father. That was when it really hit him that his life was going in a downward spiral. His girlfriend had left him and he wanted to end it all, he said. She asked, “How can I love her and the kids when I kept getting locked up?” Which is understandable, Stevie said. Over the next 12 years he lived on the streets, getting a routine down on where and when he would be to keep busy, stay fed and stay safe throughout the day. 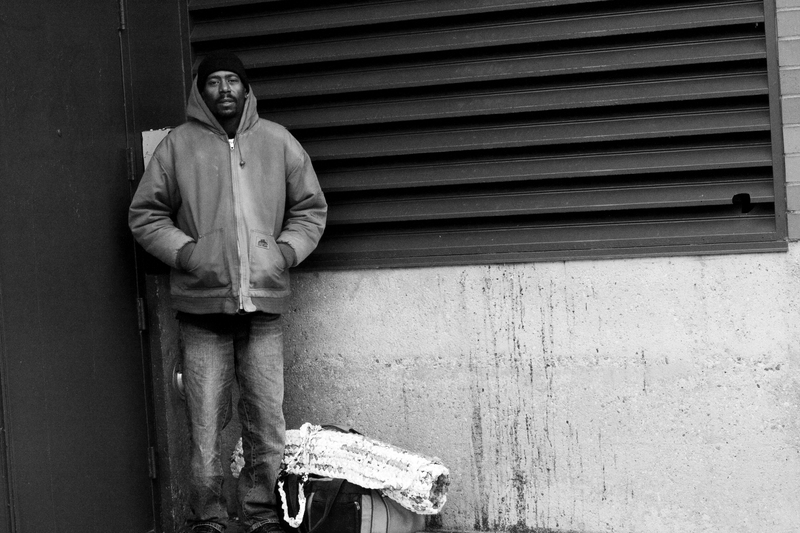 He is what the state calls “chronically homeless,” consistently going back to the streets. For a year he was provided housing, before he lost it because of drugs. Now Stevie is ready for change. Stevie’s next step is to get an ID and enroll at Mott Community College for automotive mechanics, something that he loves to do, he said. He wants to get his own place, his own car and his own life back. As he finished we prayed with Stevie and thanked him for his time. 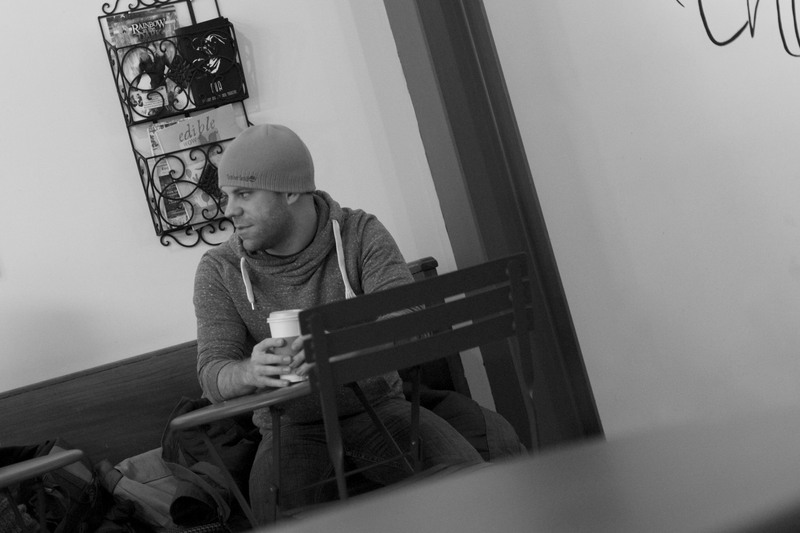 It was unexpected to hear his story that day but we both walked away amazed at his life and his honesty. Tagged "I'm tired of the streets." We saw Steven sitting on wet, stacked up brick pavers that enclosed a small park outside of the homeless shelter he lived in. Steven was rolling a cigarette from tobacco he had in an Altoid tin, along with three other homeless men, all outside on their smoke breaks. We sat down and introduced ourselves to Steven. We were a bit out of place. All the men around us were wearing second hand coats that were ladened with cigarette smoke, torn jeans and tennis shoes. We approached them with our black pea coats and iPhones ready to hear their stories, something we will reconsider in the future. We explained to Steven that we’d like to interview him, hear his story, why he was where he was and what his life was like now. He seemed reluctant at first but warmed up to us as he prepared his cigarette and agreed to share his story. Steven came to Flint because, in his words, Flint is a good place to be homeless. He owned a home and had a steady job. That is until 2010 when he lost his job and his unemployment ran out leaving him nowhere to go but the streets. “I was shocked. I didn’t know what to do when I first got thrown on the streets,” Steven said. He was homeless for less than a year before he found a job at a ranch. Three or four months ago he found himself homeless again and living in downtown Flint. He works on the work crew at the shelter where he stays, but that’s not the life he wants for himself. Steven was adopted at a young age by his adoptive parents, who lived in Davison at the time. Steven was born with fetal alcohol syndrome and an addiction to Cocaine. Growing up he had mental and emotional issues, which he named off – bipolar, mild schizophrenia, post traumatic stress disorder, anxiety and depression. Because of these issues, Steven had a hard time holding a steady job. He also butted heads with his adoptive parents, who didn’t accept that he had the mental or emotional problems. Tension grew between him and his parents because of their strict religious beliefs. After a stint in high school, Steven left home. Around the age of 16, Steven started experimenting with drugs and alcohol, but he was quick to reassure us that he has been clean for a year now. He told us “you can’t stay here if you’re buzzed.” As a young man he took the drugs as a self-medication for the mental and emotional issues that he had been dealing with all of his life. The same stuff that had created the issues was the same thing he was taking to deal with the issues. He said that the drugs temporarily masked the problems. And after continually losing job after job and everything he had, he became homeless. 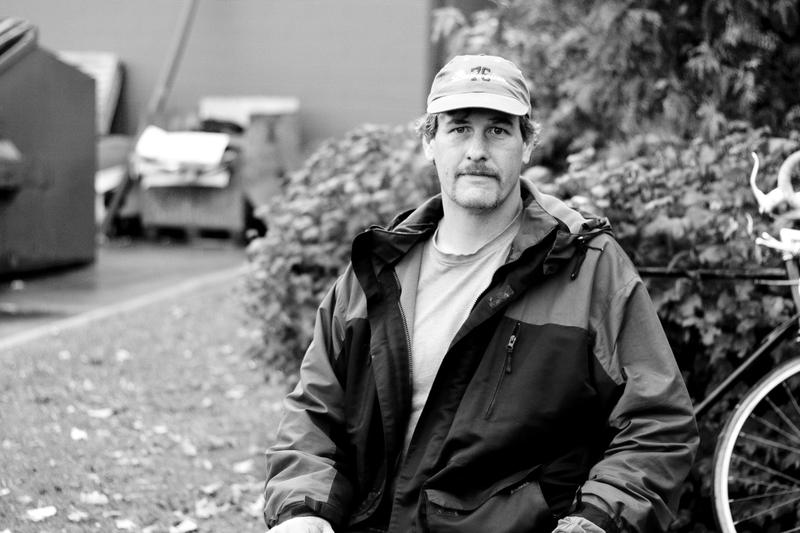 When Steven first became homeless he lived on the streets and in abandoned homes, along with other people he knew. He continued to look for jobs but didn’t have much luck. But he knew life on the streets wasn’t something he wanted for himself. No one really knows what can happen on the streets, he told us. People living on the streets often stay in groups to watch out for each other, he said. He demonstrated that mentality to us as a man approached him during the interview and he didn’t hesitate to share the small amount of tobacco he had, taking no money even after the man offered to pay. Steven’s situation brought him to Flint. Here, in his opinion, is the best area to be to get what he needs. “Flint is the best area to get free meals, stuff like that, be fed,” Steven said when we asked what brought him downtown. On top of the meals and the shelter, Steven also has access to a psychiatrist every other week, paid for by the Genesee Health Plan. But all of that is not stopping him from looking for a job. He has applied for more than 150 jobs, but none have called back. Steven still has hope for the future. Just like most of us, Steven wants to find a job that he loves doing and will keep searching, he said. His break time ended, which we realized we monopolized. We thanked Steven and shook his hand and he went back to work at the shelter. We feel privileged to have spent time with him and heard his story. His five-minute break turned into a 15-minute conversation with us. This is the first story of many in a series we are calling Flint Stories Project. Please continue to check back for more stories. Feel free to contact us at flintstories@gmail.com. Our mission, through stories, photos and video is to share the lives of those living in poverty. We hope to respect, listen, retell and help improve the lives of those we connect with. Hearing someone’s story puts you into their lives for a short time. Understanding their story, taking the time to appreciate it and learning from it makes you part of their life. And they also become part of yours. That is what this blog is about. You encounter many people everyday that earn only a second of your time, maybe less. But the community around you is more than just a passing glance. We have had the privilege and honor of meeting people on the streets of Flint, many whom we now call friends. The hope is that this blog not only brings you their stories, but invites you to meet people you now see as strangers and share a piece of yourselves. Flint, its streets and the areas around it have a great story to tell. And we want to share it. We hope to post stories on a regular basis and learn more about Flint and the community ourselves as we go. Feel free to share this blog with the people you know and let us know what you think.